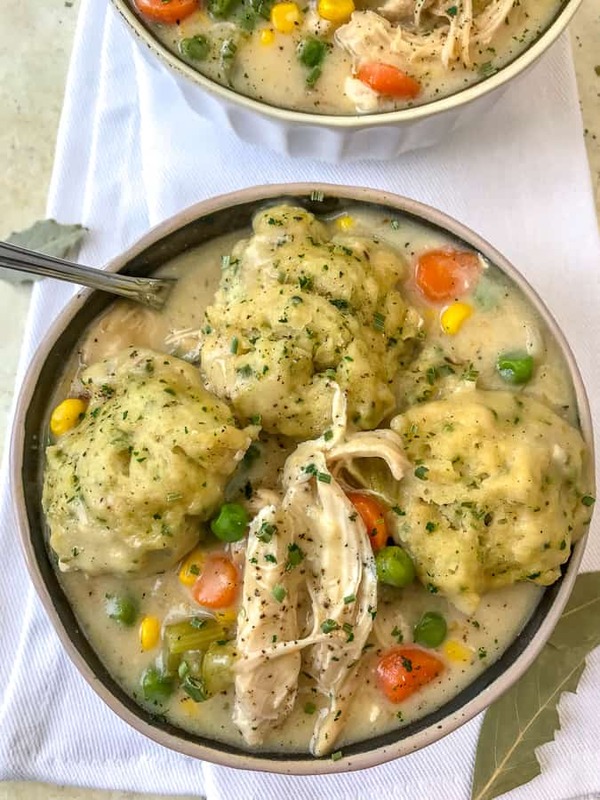 This Easy One Pot Chicken and Herb Dumplings recipe is going to give you all the comfy feels, from the top of your head to the tips of your toes, while warming your heart! A classic comfort dish lightened up, but full of traditional flavors. 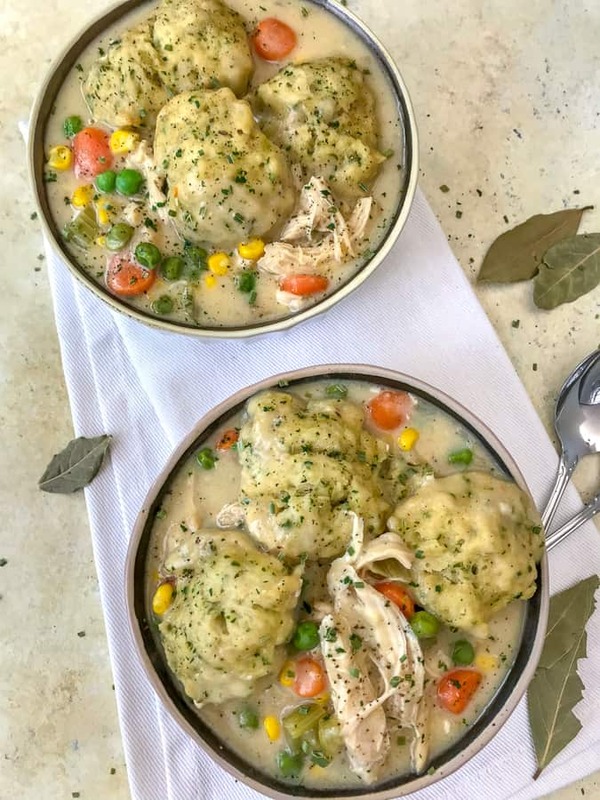 A creamy soup base, loaded with juicy, tender chicken, tons of vegetables, and topped with fluffy butter-herb dumplings. Each spoonful is filled with so many delicious flavors. One pot meals will spoil you very quickly, I swear! They are so easy to make and take very little effort with cleaning up. With the holidays here, we are busy enough shopping, cleaning, working and washing up after a day full of cooking for family and friends. So take a break from the holiday chaos and give yourself a break in the kitchen! Which is what makes this recipe simply amazing. Aside from the ingredient prep, this entire recipe is cooked in one pot on the stove. So minimal items end up in your sink to be washed! Another fun bit? You may not even need to go to the store for the ingredients and yo can even get creative with the ingredients! If you don’t have the vegetables listed in the recipe card below (carrots, corn, peas, celery, or onion), then get creative and add the vegetables you have on hand! Squash, cauliflower, broccoli, etc. I promise it will still be delicious. So much deliciousness cooked into one pot! Easy, easy, easy. That’s what I love most. Start by browning the chicken. You can use chicken breast or chicken thighs. Or a mixture of the two for maximum flavor. I used boneless, skinless chicken breasts that I sliced down the middle to thin the breasts out. Using thinner/smaller chicken will help it cook easier and quicker. Once the chicken is cooked, it is removed from the pot and the vegetables are added to saute until tender. Then we add in the flour, liquids, and seasonings. 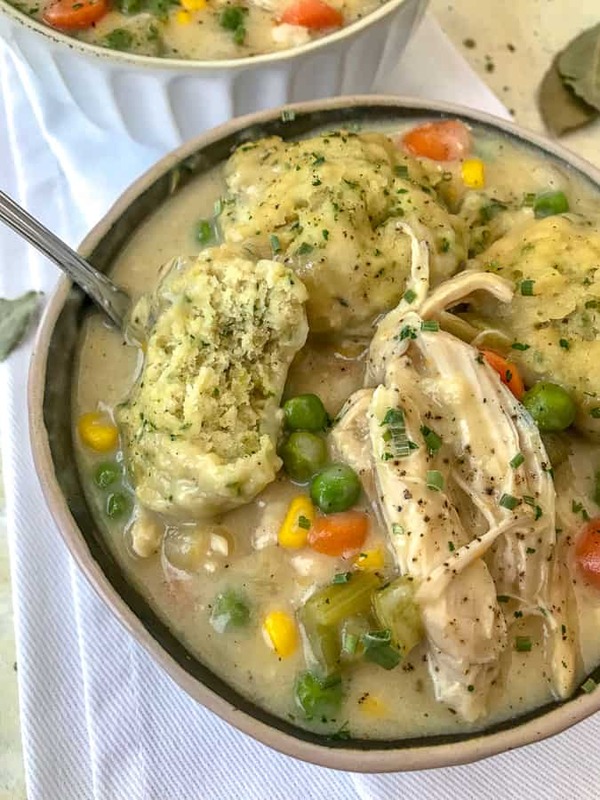 The chicken gets returned back to the pot to warm with the peas and corn while you make the dumplings. Which is a simple mix of the ingredients, followed by a few scoops of the batter into the pot. From there, the dumplings firm up, you garnish, and that’s it! Super easy and super flavorful! SODIUM: If using regular chicken stock or broth (containing salt), season the chicken and soup to taste. You may want to adjust as to not create an overly salty soup. STOCK/BROTH: If you don’t have stock, you can use chicken broth. Stock will be more flavorful, though. PEAS & CORN: You can use frozen or canned. If using canned, drain first prior to adding to the pot. CHICKEN: Use chicken breast or thighs. You can use pre-cooked chicken if you have it on hand. Simply skip the cooking steps and add to the pot with the peas and corn to warm. THICKENER: This recipe calls for all-purpose flour. You can also use arrowroot or cornstarch. MILK: I used low-fat milk, but you can substitute with cashew, almond, or coconut milk. Or half and half or heavy cream. FLOUR: Don’t have all-purpose flour? Use whole wheat pasty flour, white whole wheat flour, or whole wheat flour. DUMPLING BATTER: Too thick? Add a splash of milk to thin. Too thin? Sprinkle with flour. The batter should drop from a spoon or scooper, not run. Here is the scoop I use for the dumplings! Ice Cream Scoop with Trigger – this is very similar to the one that I have. Mine is technically a melon scooper, but in all honesty — they work the same! So if you have a cookie scoop, small ice cream scoop or a melon scooper, I recommend using that for the dumplings. Makes it so easy! 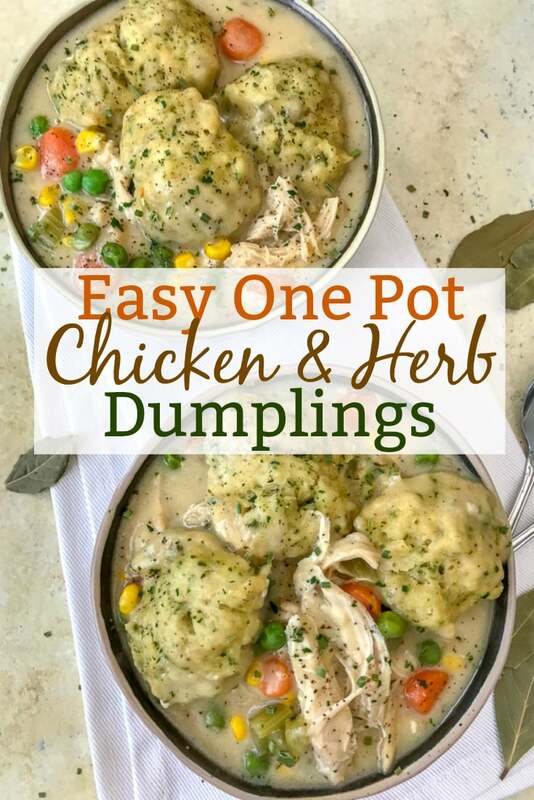 MORE EASY, ONE POT MEALS TO TRY! Easy One Pot White Chicken Chili – another lightened up recipe that cooks effortlessly in one pot! Full of chili flavors, but easy on the nutrition. 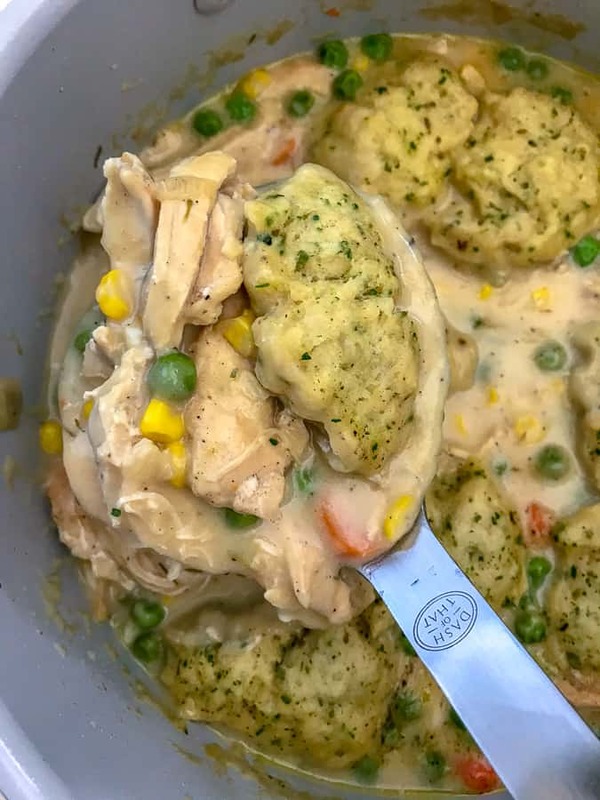 Easy One Pot Creamy Chicken and Noodles – a class comfort dish that I consider to be the sibling to chicken and dumplings. They are so similar, yet different in their own respectable way. Easy recipe to make and spoonful after spoonful of delicious taste. Easy One Pot Lasagna Soup – cut out the hassle of making lasagna and try this Lasagna Soup — all cooked in one pot, lightened up a bit, but packed full of those amazing lasagna flavors! YUM! One Pan Lemon Garlic Butter Chicken and Potatoes – so much flavor you won’t be able to stop yourself from having seconds! Because who doesn’t love anything cooked in garlic and butter?? Garlic Butter Steak and Potatoes – juicy, tender steak and crispy, fluffy potatoes cooked in one cast iron skillet of garlic, butter, and herbs. Very easy recipe that takes minimal effort. Great for lunches, meal prep, or if you’re simply looking for an easy dinner option this week. 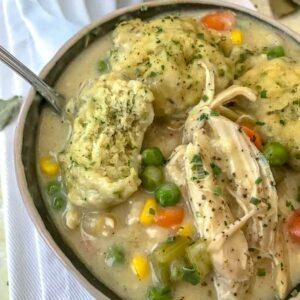 A classic comfort dish that is lightened up without sacrificing flavor and comes together easily in one pot! In a large, deep pot set over medium heat, add 1 tablespoon of olive oil. Once heated, add the chicken breast. Season with salt and pepper - to taste. Cook on each side 4-5 minutes, until internal temperature reaches 160 degrees F. Remove to plate, shred or cut into cubes and set aside. Add 1 tablespoon of olive oil to the pot, followed by onions, carrots, and celery. Stir the mixture together, scraping along the bottom of the pan with a wooden spoon to remove any brown bits left from cooking the chicken. Cook 5-7 minutes. Add the minced garlic and saute for 1 minute. Add the flour and cook for one minute, stirring to fully coat the vegetables. Pour in the stock and milk. While the liquid simmers, stir consistently until it starts to thicken. Sprinkle in the seasonings: salt, pepper, bay leaves, onion powder, and thyme. Stir to mix. Cover and allow to simmer for 8-10 minutes. Add the chicken back to the pot to warm with the peas and corn. Remove the bay leaves. Give it a good stir and re-cover. While that is simmering, combine ingredients for the dumplings into a medium bowl. First combine the flour, baking powder, salt, pepper, chives, parsley, and onion powder. Pour in the milk and stir slightly. Add the butter 1 tsp at a time or in small chunks. This will make it easier to cut the butter into the flour with a fork. Mix well. Reduce the heat to low. Using a scooper, drop 2 tablespoon-sized balls into the soup. Batter should make 8 dumplings if using a 2-tablespoon scoop. 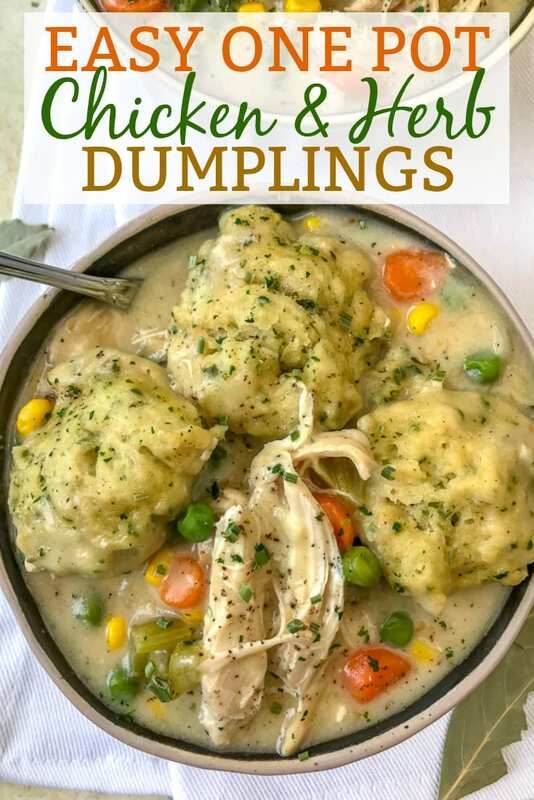 Cover and allow the dumplings to firm up, approximately 10-12 minutes. The dumplings will increase to 2-3 times their size. Season with salt and pepper, to taste. Serve immediately, garnished with dried chives and parsley. STOCK/BROTH: If you don't have stock, you can use chicken broth. Stock will be more flavorful, though. FLOUR: Don't have all-purpose flour? Use whole wheat pasty flour, white whole wheat flour, or whole wheat flour.